I think of myself as a cross between affable and exacting. As a mom, I am tough about some things and others I let slide. Belle takes her shoes off in the car; I don’t bat an eyelash. Drawing on the furniture repeated even after time-outs; I throw those crayons out. My mother on the other hand was a softie with me and continues in the same vein with Belle. For example, I have a no lip-gloss rule with my two year old. Her sitter had wizened her up to the world of make-up and Belle loved what she saw. She began waking up in the morning begging for lip-gloss as if she had slumbered Sephora dreams. At family events, she cried that we allowed her to go out without make up. Seriously. Two weeks ago, I am standing in the apse of a church at a funeral with all of my inlaws. (I mean cousins, aunts, great aunts, second cousins—picture ½ of the Italians in Cincinnati.) I am seriously nauseous; we are singing the first hymn; my two year old is begging me as loudly as she can about lipgloss. So, you say, where does a two year old get lip gloss? Thanks to the fact that Belle is really into showing off her new verbal skills, I learned from her that her source was her dear sweet grandmother. Darn softie. So, tonight, with J—working late, Belle decided she wanted to move into her big girl room. I made up her new bed with all her animals (8) and blankets (5) from the old room. We read stories, we talked about all of the family members that love her, I tucked her in, and then I reached for the light and the door. This is a routine that works without a hitch in her old room. But, in the new surroundings, I first heard a scream then “No, mommy, no.” Generally, I would have been tough. In the end, I waddled her mattress back to her crib, made it up, and started the nighttime routine again. To which my mother said, you should have just closed the door and let her cry. Go figure? But, Belle's protestations were different. As I looked into her face, as she stood arms outstretched as she stood sobbing on her new bed, I saw a realization dawning on her face--life is about to change for my little bug. After all the screaming and trauma, I sat down in the kitchen. Life is sure about to be different. I feel like yesterday I was just young and fairly carefree and now I am a suburban mother of two (God-willing.) The banality, repetition and immediacy of existence often prevent self-assessment. So there I sat in the kitchen, munching on ice to keep down the nausea, pondering what life would be like with two little ones. Dinner was fairly far from my mind. But, J—would be ravenous after working late (and since he has been doing most of the cooking for 8 months), I decided to make him something. I decided to create a bastardized Sicillian pasta dish that involved little to no work. The result was surprisingly good. I tossed eggplant cut in ½ inch cross sections, whole small button mushrooms, cherry tomatoes, 1/3 head of garlic, and ½ can of chickpeas with olive oil, sea salt and paprika and roasted it at 400 for about 20 minutes (or until brown.) When out of the oven, I turned the garlic into a paste with more salt, olive oil, and balsamic. 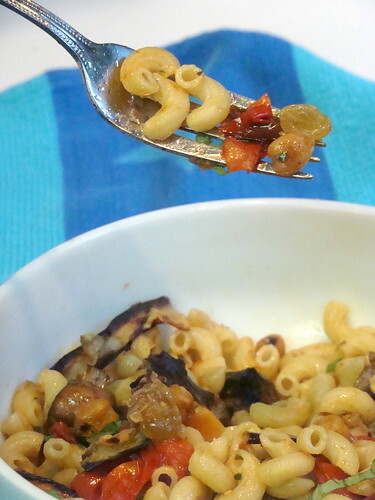 Tore the eggplant, and then tossed veggies, garlic paste, cooked macaroni, yellow raisins, crushed red pepper and fresh oregano together. Totally delicious. At least my parenting woes did give us something good. And since this was a presto meal, this is also my entry for Presto Pasta blog event this week hosted by Katie of Thyme For Cooking and started by Ruth of Once Upon a Feast . Coming home, after a long day, and someone else had prepare a delicious dinner is a real treat. Looks really good. Great post. Hopefully, by the time you read this, Belle will be liking her big girl's room. And thanks for sharing a very tasty treat with Presto Pasta Nights. Beautiful. :) Such a free spirit in your cooking, even when the act is out of necessity. It's really lovely. This must have been the night we were both cooking chickpeas. Except you didn't spill yours all over the floor. Hehe. I made the pasta ceci with mine last night and it was delicious. You'd probably love that one as well. ohhh, i love love love the raisins in there!! it looks amazingly delicious! 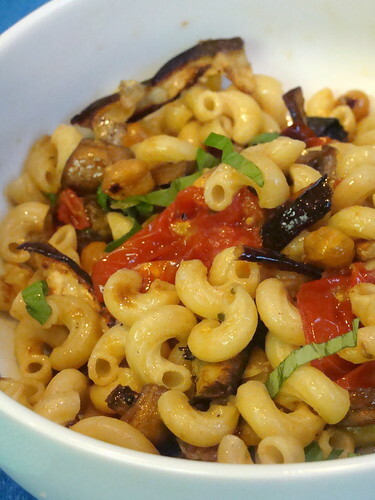 This is an off-beat pasta dish but it's wonderful! Clean flavours, healthy and satisfying. This will definitely be a quick pasta keeper (never thought of roasting chick peas)! And I love the idea of Belle having "Sephora dreams". How adorable and maddening all at the same time. I would be loathe to give a two year old lip-gloss - there is enough time to worry about looks later (if ever!). But I know my mom (and sis) would give it to her too. Ah family, life changes... a quick pasta meal is just what we need. Thanks! I love the sound of eggplant, chickpeas and raisins together. And aren't you brilliant? I would never have thought of roasting chickpeas! As to the life changing events... Cherish it - there's more that keep happening. I love the combination of flavors in this pasta dish. THis looks delicious. Eggplant is my favorite vegetable and whenever I See it in a recipe, I scream of joy:) I think it adds nicely to many dishes. Your paste looks very good.